Like the periodic whirr of locusts in the summertime, there is a hypnotic ebb and flow of small team discussion and synchronized keyboarding particularly after midnight under the glow of fluorescent lights with a dozen round tables, bins of chocolates and Red Bull, and nearby the disarray of an earlier invasion of pizza hounds. And then at the stroke of each hour, a brief interlude of trivia and door prizes that reminds the body to stand, stretch, and peruse our temporary domain. This is the setting of the annual FNC Forge, a 24-hour internal hackathon that grew out of the company’s Employee Driven Innovation (EDI) Program. With over a 50% increase in participation over last year, the 2014 Forge was a resounding success. FNC had the privilege of Ross Bjork, Director of Athletics at Ole Miss, kicking off the event Thursday afternoon, Dec. 18, with a bang and a short-term loan of his heavyweight wrestling championship belt. Contestants represented a diverse footprint of departments, including a strong showing from the development group as well as Mortgage Trade, R&D, QA, Internal Systems, and Marketing. Likewise, the range of project techniques and targets was diverse from code refactoring to new product development, and from usability redesign on existing platforms to new consumer products. And all were illustrated by wonderful presentation. Technologies included: C#, ASP.Net, MVC, JQuery, Ajax, Classic ASP, Xamarin, SqlServer, MTM, MDS, Elasticsearch, AngularJS, Redis, SignalR, RabbitMQ, Zulu, F#, XCode, Swift, iOS SDK, Protovis/D3. An abundance of KnockoutJS and Bootstrap gave many of the 24-hour solutions a slick, elegant look. I was repeatedly impressed by the teams’ forethought and clarity of plan. Each team I spoke with readily paused to give me an overview of their objective and a quick demo. Some teams went on to show precursors to follow-up work that promises to carry the same momentum as the Forge project, holidays notwithstanding. And with the exception of a couple of one-man teams, it was obvious to me that most teams held focused, out-the-gate discussions to help them coordinate their approach to the evening’s effort. Bethany Cooper and Kim Byler did an excellent job at picking out trivia questions to hand out door prizes throughout the evening. While keyboards were still clicking at 3 a.m., there were already beautiful functioning interfaces to new routines and services. I heard more than one team comment on how what they were doing was clearly “not work.” This, in addition to the open dialogue and sharing of technology and methods, really seems now to distinguish the event as an opportunity for creativity and passion to flourish. Albeit protracted, pushing four hours, the closing presentations and awards ceremony were well attended. President Glen Evans did a great job at conveying executive enthusiasm and reiterating CEO Bill Rayburn’s strong support of the Forge and its underlying spirit. It will be important to get feedback directly from the six judges, but it was apparent to me that they had quite a difficult time selecting winners. And although participation in the event itself is a reward and to which many plan to return next year, the addition of tongue-in-cheek certificates from Director of Information Security, Manager of Quality Assurance, and Director of IT were priceless and gave each team recognition in an entertaining and memorable fashion. Section 1 gives background information about the appraisal data. Section 2 explains the motivation behind this work. Section 3 explains the automated sentimental analysis methodology. Section 4 gives a conclusion. Section 6, an appendix of classifier performance. In the U.S. real estate market, the single-family house is the most common type of residential property. For a lender to approve a loan, an appraisal has to be ordered on the property. Typically, the appraisal is done in the so-called “1004” form. In addition to collecting characteristic data about the property, appraisers also provide their subjective comments, i.e. their personal opinion. Below are some examples of appraisers’ comments. (These comments have been taken directly from the appraisal report). • C3;Kitchen-remodeled-one to five years ago, Bathrooms-remodeled-one to five years ago, THE CONDITION AND QUALITY OF CONSTRUCTION OF THE SUBJECT ARE AVERAGE AND CONSIDERED TO BE TYPICAL OF THE AREA. THERE WERE NO NEEDED REPAIRS NOTED. • The subject property is a 3 Story attached three family dwelling with full basement. It is in overall average condition with sound brick exterior, dry foundation and average quality roof that had no reported leaks. The interior has standard kitchens and bathrooms with average quality cabinets and appliances, all in working order. No need for repairs as of the time of inspection. • THE HOME APPEARS TO BE IN FAIR CONDITION BASED ON A DRIVE-BY APPRAISAL, REALTOR COMMENTS AND THE SUBJECT’S AGE. KNOWN DEFERRED MAINTENANCE INCLUDED SOME ROTTEN EXTERIOR SIDING ALONG BOTTOM EDGEG. HOME HAS A DETACHED BLOCK STORAGE BLDG THAT HAS ROOF LEAKS AND WAS GIVEN NO VALUE. • C4;No updates in the prior 15 years;THE SUBJECT PROPERTY IS IN AVERAGE CONDITION. THE IMPROVEMENTS INCLUDING TILE FLOORING, CARPET, STANDARD KITCHEN APPLIANCES AND TILE COUNTERS IN ALL BATHROOMS ARE THE BASIC BUILDER UPGRADES. THERE IS PEELING EXTERIOR PAINT IN THE RONT LOWER AND UPPER LOORS. The motivation behind this work is to design a system which can automatically classify the appraiser/user comments into one of the three categories, i.e., positive feedback, negative feedback and undetermined feedback and then assist people in making the appraisal review decision process more effective and efficient. The system will also help users find high-risk applications quickly. 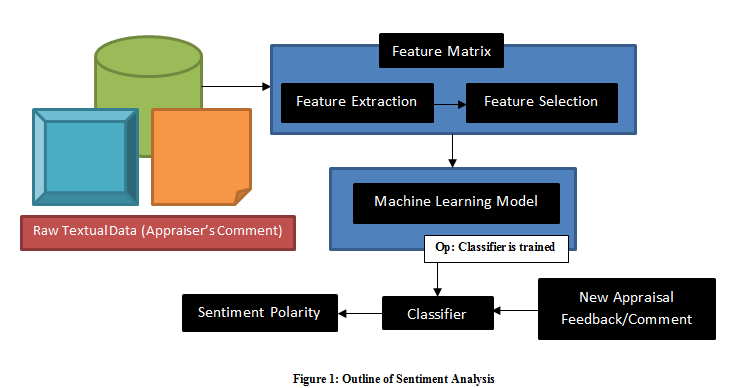 We have designed our automated sentiment analysis system by utilizing the techniques offered by text mining and supervised learning. An outline of the system is shown in Figure 1. There are three phases in the system. Below is a brief description of each phase. Phase 1: Feature Extraction – Feature extraction is used to transform the raw textual data into a numeric set of features that can be fed to a classifier. These features set will extract the relevant information from the input data in order to perform the desired task. Figure 2 in the appendix section shows a snapshot of the transformed numeric data. Phase 2: Feature Selection – Feature selection is used to select a subset of relevant features for use in model construction. In this phase we will find the top features from the features obtained in Phase 1. This has been done by using the ranker method and eliminates all the features/words whose frequency is below some threshold2. Figure 3 in the appendix section shows the snapshot of the trained data. Phase 3: Classifier Training and Results – In previous phases we have preprocessed the raw data. The finished product, training data, will be used to train the classifier. We have experimented with different classifiers like Naïve Bayes, Random Forest, Neural Network, SVM, and SMO, but Naïve Bayes3 has outperformed all other classifiers and achieved the best classification accuracy. Therefore we have used a Naïve Bayes classifier for our automated system to classify the new instances into their respective category. We have performed the experiments to evaluate the accuracy and efficiency of our automated sentiment system. The obtained results have been validated by using statistical measures such as 10-fold cross-validation4, TP-Rate and FP-Rate, etc. 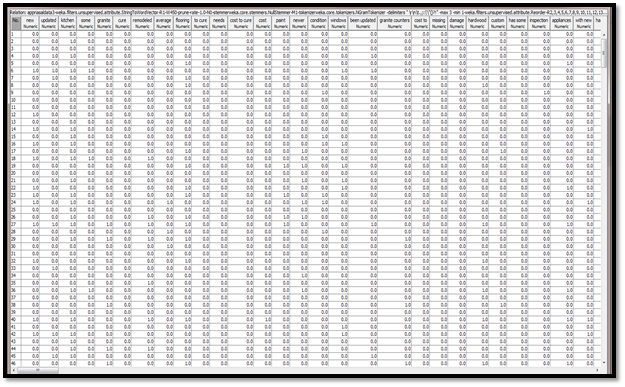 In this study, we have used an improved condition appraisal dataset, which consists of 491 instances. These instances have been labeled with the help of a reviewer. Below are the brief results of our experiments. We have used two versions of Naïve Bayes; one is Gaussian Naïve Bayes and other is Multinomial Naïve Bayes. Our automated system has been able to correctly classify 412 instances by using Gaussian Naïve Bayes and 407 samples using Multinomial Naïve Bayes. Detailed results are presented in Section 6.1. The manual appraisal review decision process takes up a significant amount of time and can be cumbersome, which can lead to poor efficiency and diminished performance. In order to improve this manual system, we have designed an automated sentiment system, which is effective and efficient and can overcome the existing limitations. The applications of our system are discussed in Section 5. Once the classifier is developed like Naïve Bayes in Section 3, it is embedded in the regular program and can be used for different applications. Below are some of the applications. (User Input): The kitchen appears to have been updated within the last 3-8 years. All windows except for those found at the family room addition at the rear have been replaced with thermal pane windows that appear fairly new. The subject appeared to be in average condition from the exterior with respect to other properties in the subject development and subject market area. The backyard condition and interior condition obviously couldn\’t be determined during the “drive-by,”. The subject’s exterior wood trim is in need of scraping/painting where peeling or chipping has occured. The estimated cost to cure is approximately $750.00 or less. This does not have a negative impact on the subjects marketability nor the Appraisers opinion of value for the subject property. Kitchen feature wood cabinets, laminate countertops and vinyl flooring,updated bathroom feature ceramic tile flooring and ceramic tile shower enclosure. Our automated sentiment system will give output in the following way. (Red represents Negative feedback, Green represents Positive feedback and Blue represents Undetermined feedback.) The system will assign a category to each type of feedback with their probability values and will also tell the percentage of their presence in other categories in terms of probability values. Below is the system output of the above user input. The second application is batch mode. Consider this hypothetical question: Are the appraisals from two areas having the same sentiment distribution? In other words, would it be possible for one area’s appraisals to have more positive (or negative) comments than the other one? A batch mode process can facilitate this analysis. In the below example, we took a pool of appraisals consisting of 4,000 paragraphs. 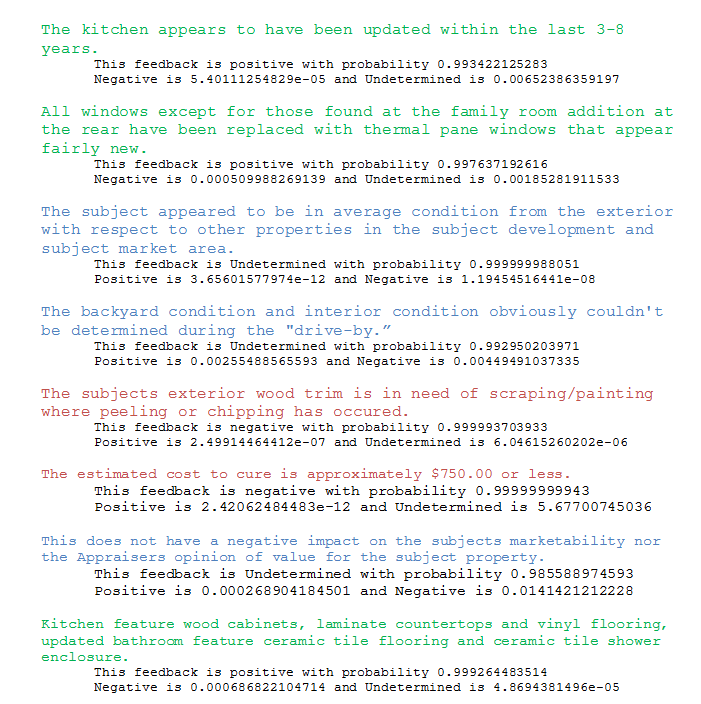 Our system broke this down into 15,732 sentences and assigned all of them their sentiment polarity, which consists of 2,343 sentences in the Positive category; 2,060 sentences in the Negative category and 11,329 sentences in the Undetermined category. In this section we have discussed the results in a detailed manner and have presented the figures used in our methodology. We discussed the brief results in Section 3 (Methodology). Below is their detailed explanation. In this study, we used an improved condition appraisal dataset consisting of 491 instances. It has 94 instances in the Positive category; 107 instances in the Negative category and 290 instances in the Undetermined category. These instances have been labeled with the help of a reviewer. 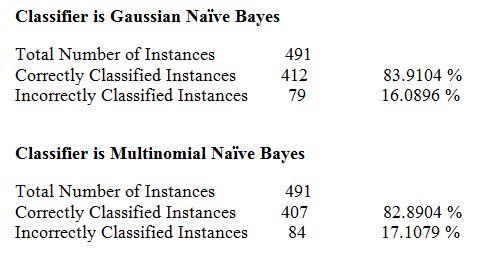 When our system used the Gaussian Naïve Bayes classifier, we able to achieve 83.91% overall accuracy where 412 instances were correctly classified and 79 instances were wrongly classified to other categories. The Positive category had 94 instances out of which 71 were correctly classified and 23 were wrongly classified to the Undetermined category. The Negative category had 107 instances out of which 67 were correctly classified, 2 were wrongly classified to the Positive category and 38 were wrongly classified to the Undetermined category. 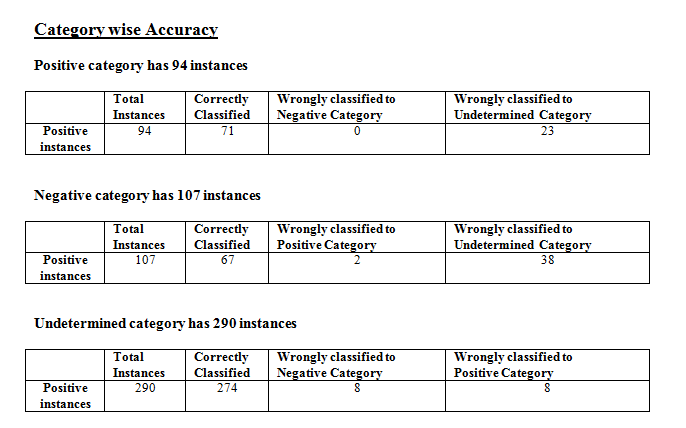 The Undetermined category had 290 instances, out of which 274 were correctly classified and 8 each were wrongly classified to both the Positive and Negative categories. These results are shown in the table below. When our system used the Multinomial Naïve Bayes classifier, we were able to achieve 82.89% accuracy overall, where 407 instances were correctly classified and 84 instances were wrongly classified to other categories. The Positive category had 94 instances, out of which 74 were correctly classified and 20 were wrongly classified to the Undetermined category. The Negative category had 107 instances, out of which 68 were correctly classified, 3 were wrongly classified to the Positive category and 36 were wrongly classified to the Undetermined category. 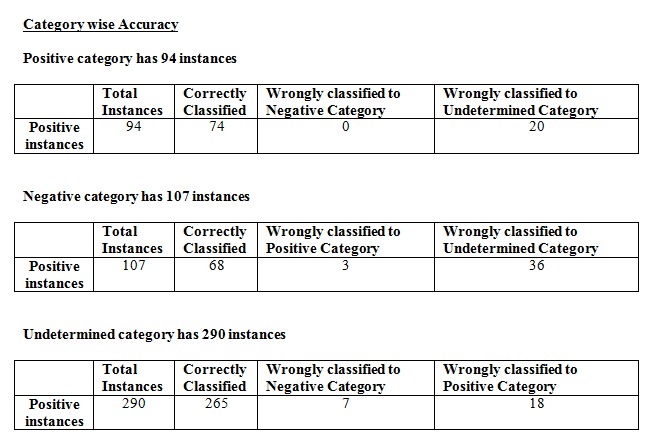 The Undetermined category had 290 instances, out of which 265 were correctly classified, 7 were wrongly classified to the Negative category and 18 were wrongly classified to the Positive category. These results are shown in the table below. Figure 2 is the snapshot of the transformed numeric data that we generated in Phase 1 using feature extraction method and Figure 3 is the snapshot of the training data that we generated in Phase 2 using feature selection. This training data is fed to Naïve Bayes to train it. Through data mining techniques, we were able to make an automated system for appraisal data that is efficient and effective and can overcome all the existing limitations of a manual process. In closing, thanks for spending your valuable time reading this post. Please do send your suggestions and comments about our work. Parts 1 and 2 of this series are here and here. So, now that all the background information is out of the way, here is an example in a real-world scenario. While the CDNA Terminal Platform SDK is specifically for developing desktop applications, these concepts are easily ported to any platform. First, we will need to do some pre-processing. Step 1. Acquire a big data set. Our plugin populates its data set from a realtime RSS feed. This feed has a couple of attributes we can use to get the latitude and longitude of the location to be mapped. Step 2. Store each location in an accessible list of some kind. Before we move on, we should note that we will need two transformations, one to convert latitude/longitude to “map space,” and another to convert latitude/longitude to “quad tree space.” Conversion from screen space to map space is handled with the mapping api call. To get lat/lon into “quadtree space” we will have to create our own. 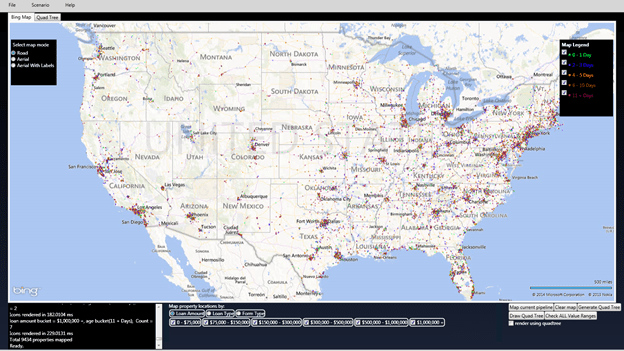 Luckily, we can get the code we need from Bing Maps Tile System. We are now finished with the required preprocessing. From this point on, we will be working solely with the objects contained in the quadtree, and not from the original list. One of the truly awesome things quadtrees allow us to do very easily is to drill down into the map without any adverse effects. Here we have 10K points, all of which are fully interactive, and the UI remains as responsive as it ever was. //The XY the user clicked on in "screen space"
//transform location into "map space"
That’s about it, guys. I hope someone finds this useful. It has been a huge boon to our project. Part 1 of this series is here. Building a quadtree from data points is simple. 1. Divide the entire area into 4 equal quadrants. Each quadrant can hold up to a predefined number of points. 2. Start adding points until you have reached the maximum for that quadrant. 3. Split the quadrant into 4 equal quadrants and continue adding points. 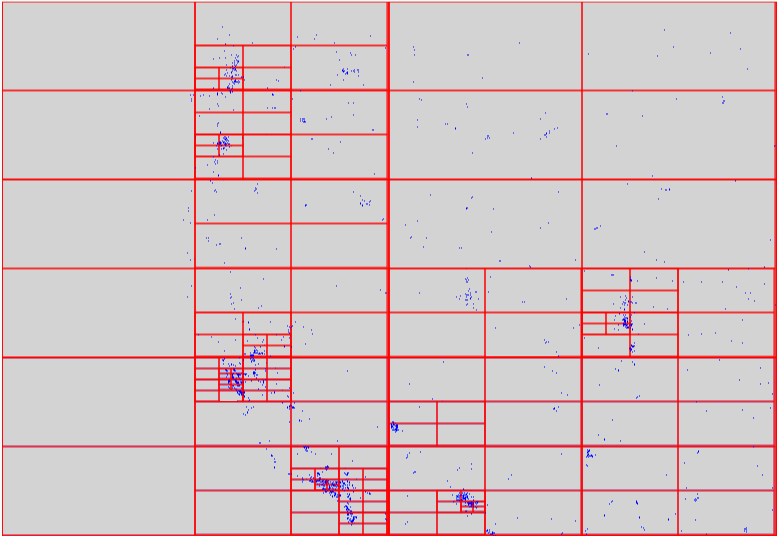 And adding points to the quadtree is straightforward. Querying against the quadtree is easy. To find all the visible points, all we need is to send the bounding rectangle of the viewport to the .queryRange(rect) method. OK. We finally made it to the good stuff. All source code is included in the archive here. Extract the archive to a folder somewhere and open the solution in Visual Studio 2012 or later. Verify the reference to System.Drawing. We create an instance of the quadtree class. Brute force array parsing: In this case we visit every array node, checking to see if we meet the selection criteria. Brute force with viewport clipping: Here we move our early out test to the beginning of the loop, using string comparison only on points falling inside the viewport. Using quadtrees: Finally, we use a quadtree to test recursively using the viewport’s bounding box as our range value. Conclusion: We can see from the test results that brute force array parsing (i.e., visiting/testing every node) is extremely slow. We manage to get almost seven times better performance using an early out test (viewport clipping). The most interesting result, however, is using the quadtree. In this case, we more than double the performance of clipping alone, and squeeze a whopping 15 times better performance over brute force alone! Stay tuned for the next installment of this series, where I will show specifics on how using a quadtree helped our pipeline map demo meet its functional requirement. In this example, we are showing around 9,000 properties, grouped by X criteria, color-coded by “days in the system.” Our functional requirement was to allow real-time drill-down into this data set. Early versions of this demo actually used pushpins with clustering, and over the next several iterations, one thing became evident. Having come from a graphics programming background (I cut my teeth on Mode 13h) I was sure I could draw them faster with a more “specialized” approach. Aside from having to convert every location into screen space to test for visibility, no matter what we come up with, we are ultimately forced to visit every array element, every frame. 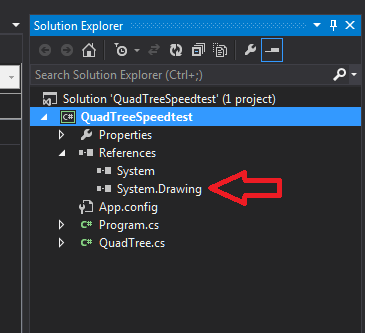 Stay tuned for next week’s post, where I will introduce the quad tree and show how to use it to speed up our real-time rendering. One of the greatest values we can provide to the customer is quick and complete visibility into the contents of their loan file, which would otherwise be an opaque stack of papers that a human would need to search exhaustively to find a particular document. A typical loan file is comprised of hundreds of discrete documents: legal documents, structured forms, appraisals, credit reports, tax documents, disclosures, financing documentation, etc. Some documents are fairly standardized and predictable, such as the URLA/1003 and the 1008, and some differ significantly by state or originator. Some documents are only one page and some can be dozens or hundreds of pages long. The loan files we process are typically 500-1,500 pages in length and contain hundreds of individual documents. We usually receive a loan file as a single PDF that may as well be a monolithic stack of papers: no table of contents, bookmarks, or any index information at all. There is plenty written already about classification and recognition algorithms, but I will give a brief overview of how we employ a variety of these techniques in concert to provide incredibly accurate indexing for the types of documents found in loan files. Nearly every loan file PDF we receive consists only of scanned images. The images can be of varying quality, from pristine digital scans to documents that have been through so many fax machines they’re indistinguishable from a Rorshach test. In order to gather textual information from these PDFs, we must first invent the universe (thanks Carl Sagan), but really, we must first rasterize the PDF, process the resulting images to adjust for binarization/rotation/skew, and then perform Optical Character Recognition on the images. We have developed a distributed, highly scalable processing pipeline using RabbitMQ (see our previous blog post) to perform these tasks in our server farm. The output of our OCR processing tells us what text each image contains and its precise location down to the letter. Now that we have textual data, we can think about what techniques one might use to classify textual data. One of the text classification techniques used by our Automated Document Recognition is a variation of one of the oldest, simplest, most popular, and most effective techniques: TF-IDF weighting, which stands for Term Frequency – Inverse Document Frequency. I will summarize it as a method of counting the number of times a particular word appears in a text (a particular document), and augmenting that information using the number of times the same word appears in all texts (referred to as the corpus). In our corpus, words like “loan” and “address” are so ubiquitous they’re almost meaningless, which is why the IDF part of this technique plays an important role. Using TF-IDF we are able to create a type of signature (a very long vector of TF-IDF weightings) for each text. Once we’ve determined the signature of a particular text as can use a variety of similarity functions, such as cosine similarity or logistic regression, to compare it to the signatures of all other known documents. Another advantage of statistical text analysis is that it can be quite forgiving when it comes to classifying “noisy” documents like the aforementioned fax-machine-ravaged images that an OCR engine may not read very well. TF-IDF weights can be used as inputs to many popular classification techniques like Singular Value Decomposition, logistic regression, etc. We can also use decision tree algorithms to accurately identify multi-page or partial documents. How do we determine what samples to use and types of documents to index? This is where supervision plays a part in supervised machine learning. The machine learns to recognize the types of documents we care about because we supervise the learning process by using known samples of documents we want it to recognize. For instance, let’s say we have 10 training samples of a variety of Trust Deeds. We can train the machine using these samples and the machine can internalize the patterns and “learn” what a Trust Deed is made of textually. The real power of this system is that it can recognize documents it’s never seen before, after being trained on just a few known samples of the respective document type. Managing the training data for your classifier can be a science and art unto itself, and is often more important than the type of classification algorithm you choose. Another key feature of our ADR system is the implementation of a positive feedback loop, or validated learning. Since it’s impossible to teach our machine everything it will ever need to know from the start (new document types will be added, forms will change, etc. ), we must be able to adjust the system’s knowledge on the fly. Using targeted manual review of current ADR results, we are continually expanding the scope and improving the confidence of the ADR system with each new loan file we process. In practice, our ADR system has dramatically increased both the scope of documents we index and the efficiency with which we index them. There was a time when loan file indexing was a completely manual process for us, and probably still is for a lot of other companies. 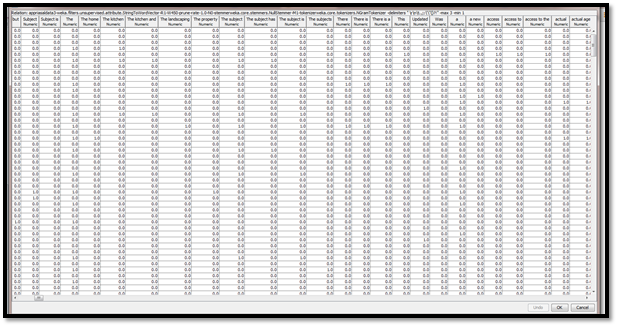 Fortunately, using data mining techniques we were able to leverage much of this manual indexing as training data for ADR. It would normally take a human worker well over an hour to index a complete loan file, and the consistency of the indexing might vary wildly depending on the worker even if they were only indexing a few critical document types. Our ADR system now indexes hundreds of types of documents at hundreds of pages per second and requires no human intervention! OXFORD, Miss. — WFNC-TV reporter Bill Dabney reports live from The Forge, FNC’s first 23-hour hackathon.